Internal combustion engines operating indoors including mechanical handling using propane fueled forklifts, ice preparation machinery, vehicles moving indoors for loading and vehicles in service stops contribute toxic gases to the indoor environment. Areas of high traffic can exposure workers to dangerous levels that cause acute and chronic health effects. The Ontario Ministry of Labour regulates the levels of toxic gases such as carbon monoxide, oxide of nitrogen, flammable gases and refrigerate gases in the workplace. Installation of a gas detection system provides continuous monitoring of the workplace for toxic gas levels and provides early warning when levels are too high and can be designed to take measures to self-correct the issue by exchanging the air. These systems can be the difference in workplace safety and a workplace incident. they can be connected to ventilation systems to control toxic gas levels. Comco Canada Inc.’s engineers custom designed gas detection systems to meet a client’s needs based on the operations occurring in the workplace, and the size of the structure that is to be monitored. Each system best represents the air quality of the particular workplace. These systems are designed to not only monitor but also to mitigate rising toxic gas levels in the workplace. In the event of rising toxic gas levels the system gives early warning and automatically takes steps such as starting ventilation systems to reduce excess gas levels to allowable levels. 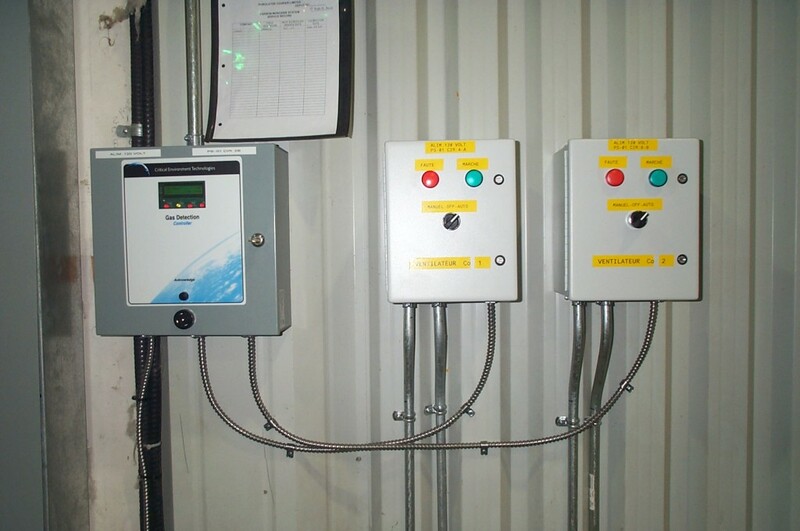 The systems are often installed so that they also have connectivity to an office to allow for continuous remote monitoring and recording of gas levels in the building. The most typically, installed gas detection systems use electrochemical sensors that give accurate and repeatable readings that are more gas specific than other sensors. These sensors use less electricity, they are not poisoned by other ambient gases and they have high resolution. An electrochemical sensor is a proven technology developed in the 1950s and continues to be the cornerstone of gas detection systems. Over time sensors will begin to drift and need recalibration -the frequency of which can vary depending on the type of sensor and manufactures recommendations. It is important for the health and safety of a work force to ensure that sensors are functioning correctly. Comco services a wide variety of sensors across Canada. Comco Canada Inc. provides all aspects of design, parts and labour required for the installation of gas detection systems. If the client chooses, our service can be provided for the life of the system, for maintenance, repair and calibration.